Lenticular print can easily be described as specially prepared graphics that are designed to work together with a lenticular lens to allow the viewer to see different images depending on the angle at which they view it. The use of both imagery and lens material are inseparable when it comes to making the desired effect come to life in a lenticular print. The image itself is a composite of two or more graphics that are interlaced together. The lens is a unique plastic that is made up of individual lenticules that must be perfectly aligned with the interlaced image underneath it in order for the effect to work. Based on the angle of the viewer, each lenticule acts as a magnifying glass to enlarge and display the portion of the image below. Many lenticules working in harmony form the entire lenticular image. 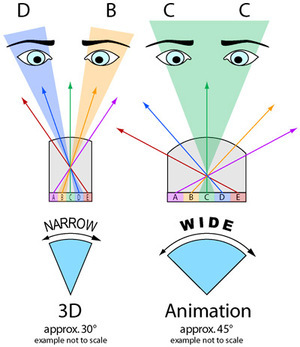 In this way, lenticular print can appear to show motion or even three-dimensions because each eye is viewing the lenticular print from its own angle. Within this section, we'll show you the details of the lenticular lens itself, how the image is prepared and printed, and we've even got a glossary of lenticular terms to help get you started.